Project staff spend a great deal of their efforts to deliver procured inputs and technologies on time, racing against approaching weather season. It is not an easy task, as they have to navigate through country procurement rules and regulations, and adhere to IFAD processes and standards. They strive to ensure that tendering processes are undertaken in an open manner, and agreed contracts clearly oblige companies to deliver quality services and goods on time. 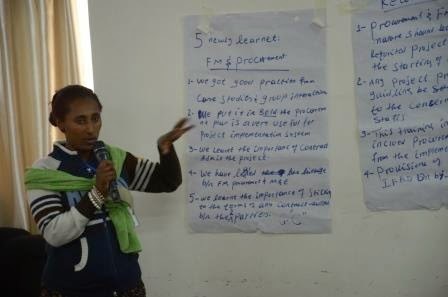 From 12th - 14th March 2014, project staff from Ethiopia and South Sudan participated in a procurement training, which covered core procurement principles to ensure that processes are transparent, well justified and maintain the best value for money. The training aimed to strengthen staff member’s ability to adequately evaluate proposals and plan for tendering processes. Financial management aspects were also discussed and budgeting best practices exchanged. Useful tips and check lists were shared to strengthen budget planning. As project members infrequently have a chance to congregate, a monitoring evaluation session on IFAD Results and Impact Managing System annual reporting requirements, and an introduction to knowledge management with an emphasis on integrating knowledge sharing and learning activities into annual work plan project budgets, were also held. Robson Mutandi, Country Director and Representative to Ethiopia and South Sudan encouraged participants to share experiences from their countries, and encouraged feedback to IFAD on ongoing procurement processes. He emphasized that everyone, including IFAD staff were there to learn and improve current financial management systems. The training went beyond the classroom and project staff had a chance to mingle and enjoy a light moment during an evening cocktail on the second day of the training. The team was pleasantly graced by the bold voluminous voice of Kisi Masahiro, the procurement specialist conducting the workshop. He entertained the crowd with some first class opera. Mr. Dejene Abesha, from the Ministry of Agriculture and Rural Development Planning & Programming Directorate, closed the training. He noted that improving the capacity of project staff to undertake financial management and due procurement processes is of paramount importance. He also appreciated that the training was held at the country level providing an opportunity to have a tailor made training programme suitable to IFAD project staff needs.